Established closers such as Jose Valverde, Brandon League and Jonathan Broxton will draw interest when they hit free agency this offseason. But those relievers aren't pitching as well as Jason Grilli, the Pirates right-hander who is enjoying a career year in Pittsburgh as he approaches his 36th birthday. Grilli’s breakout season figures to pay off a few months from now when he signs his next contract. Grilli has put together a dominant season in Pittsburgh largely because of his ability to generate strikeouts. He’s fourth among MLB pitchers with 13.8 strikeouts per nine innings (minimum 50 innings pitched) for a total of 84 strikeouts in 54 2/3 innings. He’s also fourth on the Pirates in strikeouts, ahead of Kevin Correia and Jeff Karstens, who both spent most of the year in Pittsburgh’s rotation. Grilli’s fastball averages 93.7mph, a career high. Opponents swing and miss at 14.3% of his offerings, also a career high. While he’s not quite in Craig Kimbrel/Aroldis Chapman territory when it comes to generating swinging strikes, he's ahead of swing and miss relievers such as Jonny Venters and Fernando Rodney. Both left-handers and right-handers have struggled against Grilli, the Giants’ first round pick in 1997. He strikes out 43.1% of the left-handed hitters he faces, fourth among all relievers and tops among those headed for free agency. Right-handers have slightly more success; they strike out 31.6% of the time. Overall, Grilli’s numbers are phenomenal: a 2.96 ERA with 13.8 K/9, 3.3 BB/9 and a 31.9% ground ball rate in 54 2/3 innings. Though 2012 has been Grilli's best season, he has had success at the MLB level before. He pitched effectively for Pittsburgh last year and his strikeout rate has risen in each of the last six seasons (excluding 2010, when Grilli didn't pitch). He settled for a minor league deal leading up to the 2011 season, after missing all of 2010 with a leg injury. This offseason, he’ll be one of the top free agent relievers available. He’ll be guaranteed millions and a big league roster spot. It’s a question of how much money and how many years. His agent, former MLB star Gary Sheffield, should push for a multiyear contract despite his client’s age (in case you’re wondering, the slugger turned agent was hitless in two career at bats against Grilli). Sheffield will note recent multiyear contracts signed by non-closing relievers such as Jesse Crain, Matt Guerrier and Grant Balfour. Parallels also exist between Grilli and Joaquin Benoit, who missed the entire 2009 season then pitched his way to a three-year, $16.5MM contract with a dominant age-32 season. It must be noted that the market for relief pitchers seems increasingly hostile. Multiyear contracts for free agent relievers dropped from 17 in 2010-11 to six last offseason. General managers will surely ask themselves if Grilli, who will be 36 by Opening Day 2013, can replicate his 2012 numbers. In my view the floor for Grilli is a one-year deal with a base salary in the $3-5MM range. For someone whose career prospects seemed to be fading two years ago that’d be a notable contract, but there’s a good chance he can do even better. I expect a two-year deal in the $10MM range for Grilli, who won’t be tied to draft pick compensation thanks to the sport’s new collective bargaining agreement. He’s pitching at an elite level and that’ll be reflected in his next contract. I hope the Bucs pony up for him but I’m doubtful it will happen. There’s no way, keeping Grilli has any bearing on Hanrahan. I don’t feel Grilli would hold up to close for any amount of time during a season. Have you seen him this year? Grilli could get a 2-year deal as I see it, but his age will be working against him. 2 years for $8M might be what he can get. Jason Grilli has faltered greatly during the last months of the season. 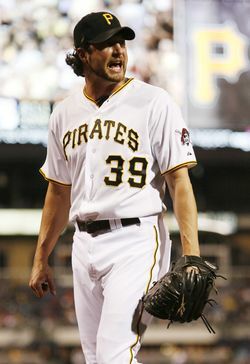 His typical one inning stint for the Pirates in a set-up role has been punctuated with losses in recent critical games. Grilli was considered the “lights out” 8th inning relief specialist for Pittsburgh from April through July, but despite his solid throwing velocity in August and September, his pitches are up in the zone and pitch selection has been predictable. There are reasons why the Pirates are scouring the waiver wire for relief help, and Grilli is one of the primary reasons. Having a career year… Fastball is suddenly a career high 93.7 mph…. Has 84k’s in 54 innings after having one full season with more k’s than innings and that was only by 4..
Something stinks of PED….. He’s been a mediocre reliever at best throughout his career. We had him in Detroit for 3-4 seasons. He’s never been lights out and suddenly on the down hill side to 40 he is?? Better hope he doesn’t get a surprise test. It only takes one stupid front office but there is no way anyone can think this guy is legit. I would take a flyer at one year and a mil or two and hope he does not get busted. I guess I missed the news that Gary Sheffield is an agent now..